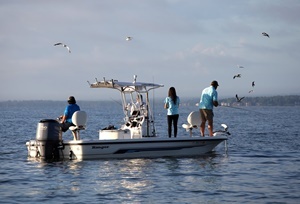 Here is our list of the best fishing guides on Lake Livingston. Want to catch a big fish on Lake Livingston, but you don't have a boat? Or are you looking for some professional Lake Livingston fishing guides to help you catch that trophy fish, then you've found the right page. Listed here are some of the best fishing guides on Lake Livingston, give them a call and you are on your way to a great day of fishing. Good luck. You should also check out Texas Outside's Review of Lake Livingston and our Lake Livingston Map. A professional, licensed and commercially insured fishing guide that has fished Lake Livingston for years. He has a the latest electronic equipment on his spacious 24 foot Ranger. He makes sure that everyone catches the fish and most important has a great time doing it.